SarahViz.com: Because My Boyz Only Watch Food Shows or Sportscenter - DVD Giveaways! Because My Boyz Only Watch Food Shows or Sportscenter - DVD Giveaways! 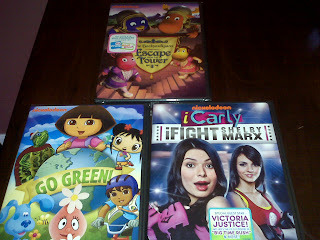 So I keep getting free DVDs in the mail from Paramount Home Entertainment and nickjr. with no correspondence or instructions. (How's that for disclosure?) I have been wanting to give them away, but they *mysteriously* get opened (and usually ripped) before I have a chance to write about them. Mr. "Not Me!" is alive and well in my Trenches, I'll have you know. He's a troublemaker, that one. This time I got smart and didn't open the packages in front of 3 sets of peering eyes. Instead, I hid them. Until now. I have 3 DVDs up for grab, because better in your house than mine you lucky readers you. The first: iCarly: iFight Shelby Marx . The second: Backyardigans: Escape From the Tower. And the third: Nick Jr Favorites: Go Green . So leave a comment with which DVD you'd like! (Make sure you leave a valid e-mail address if your name doesn't link to your blog.) I'll draw 3 separate winners on Friday. My daughter would love to watch the Backyardigans!! Thanks for doing this giveaway! Finn would love the Backyardigans or the Nick Jr... I'm thinking iCarly is a little beyond his years. Truthfully my girls would love any of the movies. But if we had to pick one I guess it's the iCarly one. your disclosure statements cracked me up! I've watched iCarly with my kids. I can't get into it...so I don't want to hear it as I drive the brood around in the car! :) So, I'd like to throw my name in for Backyardigans or Go Green! Thanks for opportunity! My daughter is an iCarly FREAK! She would love it!